The Gamlins: When Your Wife Says "We Have Mice"
When Your Wife Says "We Have Mice"
Me: We have a problem. Jonathan: Um, hello to you too. What's wrong? Me: We have MICE. Bring home mouse traps. Jonathan: Okay. I'll pick some up. How are things? Me: No, no, no. You're not appreciating the gravity of this situation. We have disease-carrying rodents in our house. Disease, Jonathan. Rodents. GERMS. It took awhile for the hubs to calm me down and, after promising to bring home the most deadly mouse traps that money could buy, we hung up and I proceeded to remain clear on the other side of the house with the kids until my conquering hero got home from work and set the traps up. Naturally, we went all night long without catching anything, which quickly led Jonathan to believe that the noises were entirely in my head. But then, oh yes, he walked back into the laundry room, heard the noise his wife had been describing, and realized that 1. either he was just as paranoid as his germaphobe spouse or 2. we had something living in our laundry room. 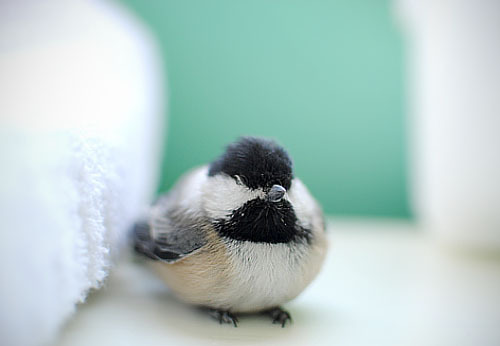 He chose option two and opened one of the pipes connected to our furnace, which subsequently led to the escape of the bird which had been trapped there for the past twenty-four hours. At this point, I heard shouting coming from the hallway so I rolled out of bed and was greeted by an overly enthusiastic husband talking to Nathaniel and exclaiming, It's a bird! We have a bird!! Feeling extremely justified at the discovery of a live creature in our house, I ventured into the laundry room with Jonathan and Nathaniel who was, admittedly, pretty upset by all of the commotion. After all, it's not every day that you hear tweeting coming from the laundry, but one look at the creature flying around the room and he was beside himself with joy. BIRD! was instantly a hit and I'm still surprised that I didn't hear a resounding chorus of Can I keep it, Mama? At that point, I turned to social media to keep my mind off of the fact that a bird was probably pooping on our clean clothes. Between Twitter and Facebook, there were a few decent suggestions for capturing the bird that we fondly dubbed George. So Jonathan, armed with a blanket, braved the laundry room while the toddler and I waited in the hallway. A few moments later, my husband emerged sans bird. George was a wily one. You see folks, this is one of the joys of an unfinished laundry room. For us, that means that there is an open access to the next room over- a gap in the ceiling that runs above the bathroom- which then leads to a drop along the nursery wall. Good old George had flown up, into the gap, and had fallen down into the wall between the bathroom and nursery. And he was stuck. Mumbling under his breath, Jonathan stalked into the garage to construct a "bird ladder" which he planned to lower down into the wall to save George while the toddler gleefully banged on the nursery walls. Poor George. Twenty minutes and one unsuccessful bird ladder later, we realized that we had one choice left: demolition. George had stopped flapping and I was becoming seriously concerned that we would have to explain that all birds go to heaven to a ever-vigilant toddler. Jonathan attacked the sheetrock with a deadly-looking knife while I held Nathaniel and seriously debated taking him out of the room to spare him the whole death speech since he already seemed rather attached to Gorg bird! But despite twenty-four hours of furnace fumes, laundry room entrapment and being imprisoned in a wall, George was still alive, a Christmas miracle. The new and improved design to Evelyn's nursery (otherwise known as the gaping hole in the sheetrock) allowed George to fly free... right onto the changing table. Ladies and gentlemen, meet George. Shortly after landing on the table, he found his way outside thanks to some quick thinking and window screen removal on Jonathan's part. And other than a fairly decent-sized hole in the nursery wall and bird poo germs, we're no worse for wear... and neither is George. The moral of this story: you are not necessarily insane when you start hearing death noises from your furnace. wow that is quite the adventure! i would probably just be hiding and freaking out! :) it is a pretty cute bird though! Oh goodness, I would have FOR SURE lost my mind.